You are here: Home / NRHA / What is the NRHA Hiding? What is the NRHA Hiding? In a world where transparency of sports performance is a public expectation, the global body known as the National Reining Horse Association (NRHA) are seemingly defiant in meeting those expectations. For sports people involved in racing, football, baseball, cycling, Olympic events to name a few, their performance is measured, reported and public scrutiny is par for the course. Their wins and excellence publicized, as like their breaching of rules in relation to drugs, bad behavior off the field, court or track. Their governing associations hold members to account to ensure the image and conduct of the sports develop in line with modern public expectations, ensuring the growth of their sport. Over the past two decades, the racing industry has evolved with stringent rules and regulations for the conduct and the welfare of horses both off and on the course. A sport that draws a high level of public attention and scrutiny, they hold trainers, jockeys and horse workers to high standards. Any breaches are public knowledge and recorded. They understand that entertainment cannot be at the expense of the animals or the minority allowed to fester bad conduct and horse abuse. 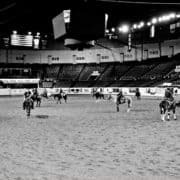 The American Quarter Horses Association is making slow but steady inroads into stemming the issues surrounding the public perception of some of their events, particularly western pleasure which draws enormous public resentment toward the style and welfare of those horses. The transparency demonstrated with suspended trainers and individual public record along with drug violations. There is affirmative action with public statements regarding disqualification of members in welfare matters. They are becoming more pro-active in addressing animal welfare. The NRHA states they are “an organization dedicated to the promotion of the reining horse. 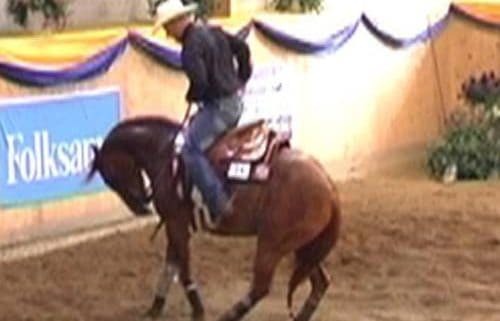 It serves as the standard setting body for the sport of Reining worldwide.” They publish welfare statements and codes of conduct for trainers, but what is the real truth behind these declarations? The NRHA response to complaints on conduct and welfare matters is seemingly one of secrecy to the point that complainants are not advised of outcomes. There is no known accessible public record of complaints being handled, and no publically defined complaint handling procedures. In fact, it seems that they default all complaint handling to the courts, as seen in the case in Mark Albro and Kyle Weston. A process that it is out of the reach of many individuals and one that fails animal welfare cases on many levels. In the recent NRHA Futurity where Casey Deary young 3yo horse, ARC Gunna Mark Ya, collapsed to the ground after backing up so hard its legs gave way. There was immediate outrage around the world and the NRHA spin doctors went into overdrive to stop the meltdown as the video went viral. The trainers statement plausible to those who needed to believe it and laughed at by others who had experience with horses. There are other videos of what is deemed by horse pub ic and the general public as horse abuse at the highest level of competition. 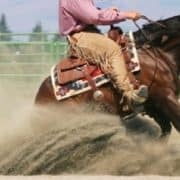 The videos show grown men and women aggressively spurring and tugging their horse’s mouths to such a point that onlookers cringe. In 2011 it caused a global outrage when videos appeared of leading trainers at an international FEI event in Europe. The image with this blog is of Craigh Schmersal at that event. The video was so graphic it was taken down by YouTube. The image being one of the only still accessible. The NRHA is noticeably silent, the trainers or riders common response being that people are uninformed. What those trainers and riders fail to understand is that people do understand and the pain and suffering caused when >100 pounds of pressure being applied to a horse mouth through reins being jerked or sawn through a mouth, or spurring that leaves dents on their sides like pulverized steak. The bending of a neck that is scientifically proven to induce pain and suffering. One can only imagine the treatment of these horses away from the lights of the show pen if this is them on their best behavior. Those same riders are held up as legends of reining by the NRHA to this day. 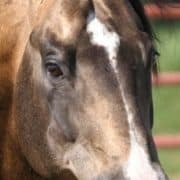 With over 19,000 members worldwide and ever increasing public outrage on the treatment of these horses, questions need to be asked of the NRHA. Their clandestine approach to what are important matters of public information should no longer be accepted. Members and the public should demand a halt to the surreptitious conduct and the NRHA adapt to modern society and scrutiny. They should publicly honor the statements made on their website and attached files through affirmative public action, transparent for everyone to see. 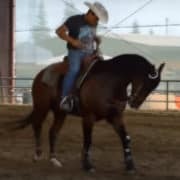 The Reining Horse is a seemingly sad story, much like that of the Tennessee Walking Horse, and the cruelty those horses endure to perform like circus animals in a show ring. Five decades later there is now only action being taken by welfare groups bringing about federal legislation to ban their practices. Those practices underlying in their associations and welfare statements but no affirmative action taken. What horses must suffer for the entertainment of a small few. If you have lodged a complaint with the NRHA and not received a public response, we would like to hear from you. We can assure you we will keep your name anonymous. http://www.reiningtrainers.com/wp-content/uploads/2016/09/Schmersal-FEI.jpg 400 500 Animal Welfare http://www.reiningtrainers.com/wp-content/uploads/2016/06/RT-LOGO2sml-300x174.png Animal Welfare2016-09-08 23:38:532016-09-08 23:42:49What is the NRHA Hiding? Is This a Reining Sport Secret?